Can fertility techniques pioneered for humans or other animals be used to try to bring back endangered wildlife species? No doubt, humans have come a long way in engineering medical solutions to our own fertility problems. The most common techniques to help people have babies today include: using medication to stimulate unresponsive ovaries to develop mature eggs; artificial insemination whereby healthy sperm is placed directly into a woman’s uterus and conception happens normally thereafter; and in vitro fertilization, which entails combining eggs and sperm outside the body and then inserting one of the resulting fertilized embryos (so-called “test tube babies”) into the woman’s uterine cavity and letting the rest of the pregnancy proceed to term naturally. While such techniques have helped millions of couples around the world bear healthy babies, only recently have scientists applied such techniques to bringing endangered wildlife species back from the brink of extinction. “The genetics of human fertility can give a better understanding of fertility in more exotic species,” reports Dr. Sherman Silber, a pioneering human fertility expert at St. Luke’s Hospital in Chesterfield, Missouri who has had success applying the lessons learned with humans to animals. To date, Silber and his colleagues have helped a half dozen leading U.S. zoos maintain healthy populations of chimpanzees, gorillas, South American bush dogs, Mexican wolves, orangutans and Mongolian wild horses using surgical techniques, artificial insemination, IVF and gestational surrogacy (where another female besides the genetic mother carries the pregnancy to term). “We have frozen ovaries in animals that are destined to die off for later ovary transplantation back to related species to be able to increase their population,” reports Silber, who has of late been ramping up efforts to bring back dwindling populations of stillwild endangered species. 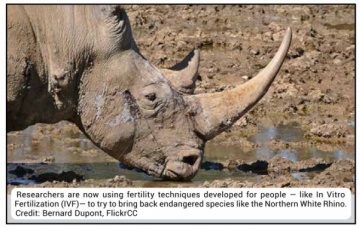 Rhino using IVF techniques. Rampant poaching in the 1970s and 1980s and surging demand in Asia for rhino horns decimated the animal’s populations in Africa – only two individuals, Fatu and Najin (both female and incapable of carrying babies due to health complications) remain alive today; the last male, Sudan, died in March 2018. CONTACTS: “Infertility Treatment for Endangered or Near Extinct Species,” www.infertile.com/infertility-treatment-endangered-near-extinct-species/; Leibniz Institute for Zoo and Wildlife Research, www.izw-berlin.de/welcome.html. EarthTalk® is produced by Roddy Scheer and Doug Moss and is a registered trademark of the nonprofit EarthTalk. To donate, visit www.earthtalk.org. Send questions to: question@earthtalk. org.